I thought there should be a Gardening section on the Hobbies Board - I know we still got one running, but who cares? Do you 'Grow Your Own', have an allotment or enjoy gardening 'Just For Fun'? Any news, views and ideas we'd love to hear, along with any photos. Spring is just around the corner, what are you plans? What do you have growing in your garden at the moment? PLanted a couple of ornamental cherries Yesterday, 'Amanogawa' and 'Kanzan'. Also, snipped the tops of a couple of Hebe's and potted them up so I can plant them in a month or so. I'm not well up on the ornamentals Mac, I know the roots of some can be quite invasive, are they standard ones? Yes, they are....If the roots cause problems I will take them out and put some other ornamental in their place. Biggest problem they have is because they are shallow rooted is they sucker, easy enough to mow over. Good luck with the graft - as I have mentioned before, it isn't something I have chanced before. Can you not find room for the Conference, perhaps cordoned against wall or fence? I suppose it depends on where you took the cutting for the graft. 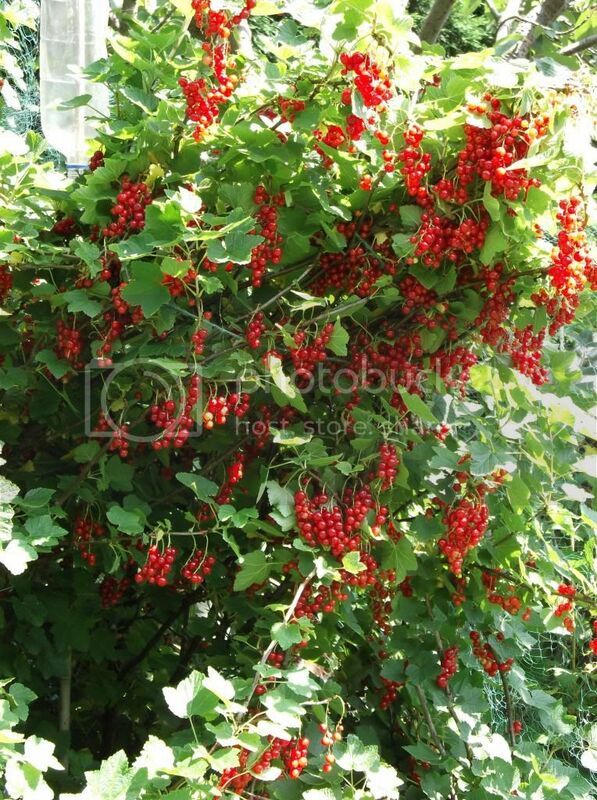 You can trim it back and tie some branches to a wall or fence, will cover the area and produce produce. Love a nice hard conference pear I do...Dostaf like a hard p,...Sorry, gardening thread. Hmmmm....I may take you up on that, TOM. Lizzie - I bet that rain was good for the local wildlife too. Amazing what survives during and after that intense heat. Thats good TOM, will have to call in, I have also heard of onion sets going cheap at Aldi too. God its cold this morning, I left a pair of jogging pants on the line last night, when I let the dog out they were pure white covered in frost (supposed to be black) LOL. I'm gonna let it warm up a bit before I do anything today, raked up loads of leaves and other rubbish the other day, so gonna burn that. My son saw an incinerator in a skip a couple of weeks ago so he brought it home for me to burn my rubbish in, it has a lid too. Birds are going mad in the garden at the moment, must be mating season. Oooh that's fantastic, unfortunately I won't be able to go, I'm working. Would be nice to hear from anyone who does go though. £2 is nothing is it? Thanks TOM, I still won't be able to go. Managed to do a couple of hours in the garden yesterday. Hands and arms are covered in scratches after tying in climbing and rambling roses - never noticed at the time. Not sure my borders at the back will be up to much this year, I asked my son to mow the grass at the back - talk about a bull in a China shop - he goes well over the edges. Talking of the grass, it has virtually dried up but is very lumpy and bumpy after all the rain, now it has dried up a little it needs some serious attention - which means keeping the dog off it perhaps a couple of weeks. Had a fire in the incinerator my son robbed off a skip - I won't tell you how he nearly blew himself up applying a little petrol 'just to get it going Mam' - daft bugger. Did any Wigan Worlders go to the tree-grafting workshop? I was on MoneySavingExpert site this morning, and someone mentioned that Aldi had seeds going for as low as 10p per packet. Can't be bad. Today I planted some seeds..
Don't know how they will turn out but they are all set out in greenhouse, I have tomatoes, radish, cucumbers, and spring onions..
Never grew anything from seed before so don't know how they're going to turn out..but fingers crossed..
Oh, and some tubers in big plant pots..
Custard - you'll have to let us know how you get on. I love crunchy radishes and spring onions in a salad. Your radishes may be ready in 8-10 weeks they will grow quick in your greenhouse. I will keep you posted Veg on how they're getting on..
All the best custard..you'll enjoy watching them all grow. Thanks Momac, just been and got some strawberries today..
Get your tins of cream in ready for them custard yummm. Veggie,I have looked everywhere for the photo of your lost J.M Barrie book..I wanted to have another look at it..we were in Bygone Times this a.m.,and there are that many books..in fact hundreds,I was just looking at every light blue book I could see,so it would be handy just to have another look at it. 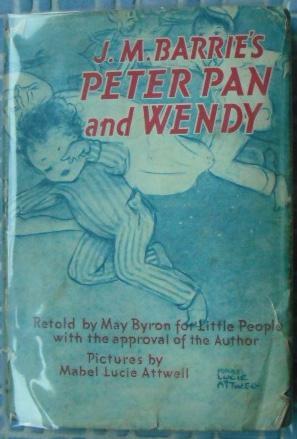 I can't believe it would have been thrown away because of the prints that were inside the book - very vivid. Ta veggie..I will carry on looking,am on a mission now. Will you be planting it and getting a lot of small novels in Autumn? momac It didn't feel like it today. It was bloody freezing. Marie,I know..I'm really fed up with the cold now..it seems to go on and on. It would be nice if I could swap a bit of your cold for a bit of our heat.....I am way passed being fed up with our heat....I can't print what I would like to say......the ground is brick hard.....baked......I have to wait until the temperatures come down to do some potting on.......bugger!!!! Gardeners Delight are usually very reliable, give them a water and stick them in the airing cupboard. That's where I put mine til they start poking through. Had a good couple of days in the garden. Pricked out 2 lots of tomato seedlings, tidied up the strawberry patch, planted the onion sets. Always feel guilty throwing away the strawberry runners or surplus seedlings. Nightchap - I know what you mean about waste, I only sow little and often now. I could cry at what I have wasted over the years. I do always find spaces for the strawberries though - some grow through the lawn at the back lol. TOM - thanks for the seeds link, I think all the others have gone on mine, as it isn't linking to the request page anymore. I haven't tried those growbags, but I have had sacks of his before that were good (a few years ago now) I think they were rotted farmyard compost or something - really rich they were. Tom,you've been brave..it's freezing out there,I've got seeds in trays,but in the back bedroom yet,runner beans..chillis,toms..potatoes chitting,nearly ready for bagging,and different flowers..but anything needing doing outside will have to wait 'til it warms up....I must be soft. Thank The Lord we are getting a few showers of rain!!!!!! Lizzie,do you want some snow as well..what I'd give for some of your warmth..the old saying 'the grass is always greener is true isn't it. Yes Momac it is true, but my grass is the colour of my avatar......you have the green grass but not the warmth.....here the heat burns the grass...but I have kikuyu grass and if we get a wet winter it will spread its runners once more and we will have a green lawn out the back. I planted a goji berry plant last year and it just grew stems and leaves. It in a pot in general compost . Has any one on WW tried these? . The berries are rich in Vit C and are only 1/2 inch long.I understand they will grow well in ordinary soil,but I think it needs a bigger pot. It is in a 10" pot right now. any advice welcome. Hello airflanc..there's an awful lot of advice on Google..sorry I can't do links. momac -Thanks for yur post , I did google,after I posted ,and found what I wanted.Int google great? Lizziedownunder_-thanks for your post too.I am intending planting it in the soil as we get some strong winds, and in a pot it wouldnt be very stable. mac I said to momac a few months ago, I don't think I saw one bee last year. TOM - I got my seeds yesterday, my son got some too as I registered his name as well. Got just the perfect place for them in the back, a border that gets sun most of the day, I'm gonna mix them with some other bee friendly seeds I managed to get my hands on. Not got round to commenting on here, had my hands full recently, I have done loads in the back though, planted Shallots - Golden Gourmet, Garlic - standard, Onions - Stutgarter and Red Onions - forget their name. My fruit bushes and trees are all looking healthy, not sure if I have lost the Apricots this year - early flowers are no good here in the North. Gooseberry bushes I planted last year are a lovely globe shape, and never been pruned. I have one red kind and 3/4 green. The only thing that is suffering is two raspberries - but I think this is down to my lazy/lacklustre pruning. Will decide their fate later. 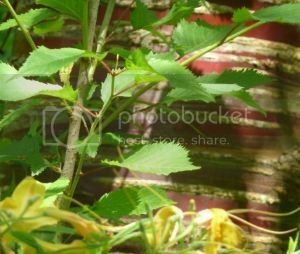 On the raspberry flip side I have a yellow raspberry that is supposed to fruit in autumn, but basically does as it pleases and has taken over a whole border - even the dog walking all over it doesn't stop it in it's tracks. Could be - that is the only red onion set I am aware of. I picked the bags up from Wilkinson's this year. I find I get better results from sets than seeds - seeds just invite the onion fly when you thin them. I am going to sow some Paris Silverskin seeds though for pickling - them and spring onions don't need thinning of course. ...never pickled before - so this year will defo be a learning curve. Tom - I know what you mean about the red onions, on the subject of chillis and peppers - I have had some germinate long after I thought they had rotted. Just leave them on the window sill. I have never grown Maris Piper or Pink Fir Apple before - I usually go for the white skinned sort. I would be very interested to hear if anyone had grown these two and have you ever stored them. I know I can google but it is always nice to know the opinions of other growers. TOM - I'm growing in sacks, as I don't really have the ground to spare for potatoes - although I could at a pinch. Were yours grown in the ground? Lizzie - I have grown Kestrel before, and they are fantastic, good disease resistance in my opinion and they gave good sized potatoes - you have set me thinking now, I may try a few of those. Tom..I grow them in bags..and it's true about the watering,I don't think I water them enough last year..my runners are sprouting in their pots,nothing yet by the way of tomatoes nor the chillies..I can't wait to get everything out in the ground,but will do it when it warms up. T&M may soon have special offer on of what they have left. They had a few good offers last year and some were going for half the price. You can get Sweetcorn that hasn't been tampered with - there are some heirloom varieties that are organic, I saw a red version the other day. I will post it if I find it. I get my sweetcorn out of one of the fields where the farmer grows them. Yum yum. have a chew on a raw one as you 'borrow' some. Yes, VERY nice, and very sweet. Mac - are they creamy when eaten fresh? As opposed to juicy when they are cooked? These Pink Fir Apples are slow at sprouting, figured out that the bottom is the thinnest part of the potato with those. Ta veggie,just sent for some. I have scattered them with my other wild flower seeds TOM. in the green house there are tomatoes,cucumbers, beetroots,lettuce,marigolds,dalias,peas,some mixed flower disks and onions, yes I have a paraffin heater it does't give off much heat but it keeps the frost away, I got a bigger paraffin heater which heats the greenhouse well, but it uses a gallon every two nights, so thats not cost efficient , how does your plants compare? A bit early yet for Tomatoes and Cucumbers in the greenhouse - I haven't had one for the last few years, but when I did I would put the Toms and Cuks in from the end of May onwards. I guess it depends on the overnight temperature of the greenhouse. You can get thermometers that record the maximum and minimum temperatures reached. When I had my allotment, I had a 30ft greenhouse with pipes all the way round, and in the shed at the end I had a big old wood burner - it was ace. Tom..my heart sings when the sun comes out and the temp goes up a notch or two..as you say everything comes to life..lovely. A little bit of advice please, I have had quite a lot of spring flowering bulbs, snowdrops and the like, these have now lost all flowers, do I need to lift these and store them?. 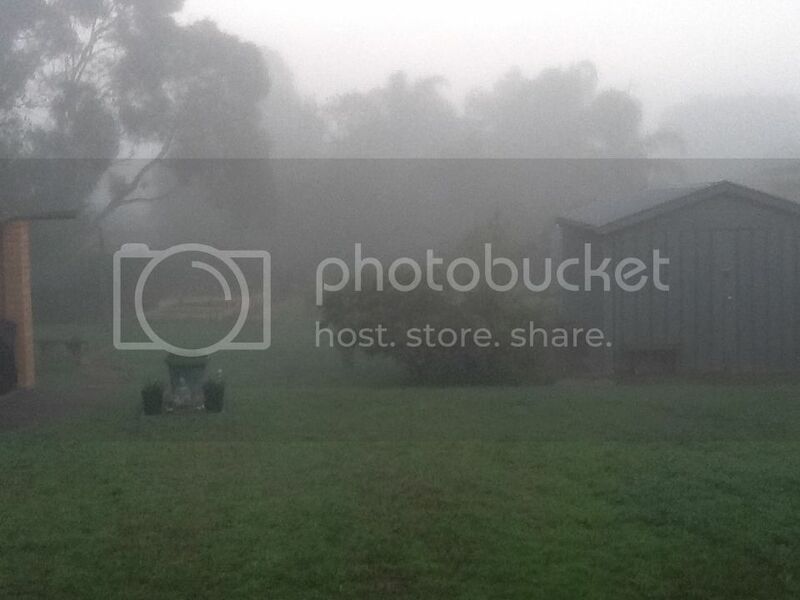 If so how best to store and what's the best place, ie shed or little greenhouse type frame. Thanks in anticipation of response. Hi Billybob, I always thought that different bulbs were treated individually. I know they used to say let the foliage die down naturally on daffodils so as to feed the bulbs for the following year, and snowdrops were better moved when still in leaf, but the RHS seems to treat them all the same and only offers standard advice - I guess the main point is only move them if you have to. 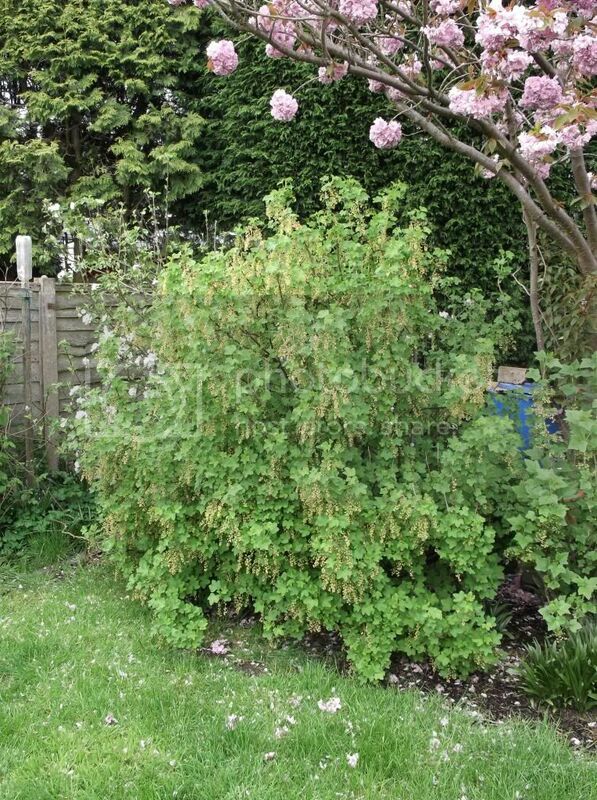 PS - I have looked on the Gardeners World forum and the general advice seems to be to let the foliage die down naturally before you do anything. Thanks veg for your advice, think ill let them be and plant around them. Lizzie - and the birds can make use of the water too. You said you were going to plant your Kestrel potatoes - so do you grow your veggies mainly in the winter then? Lizzie - I feel refreshed for your garden just looking at that photo. Well, it's a beautiful morning I was out with the dog soon after 5am. I have been pruning a few shrubs including a young Rosemary that had become unruly and wouldn't grow as it was told. Lots of info online about Rosemary, I am going to dry some, and use the stems for kebabs when we have a BBQ, I am going to freeze some and stick some in the ground - apparently they take root fairly easily. I have also seen a nice pic of a Christmas wreath that has given me one or two ideas. I asked my son to pick me some compost up last week - so I could get the last of my seeds sown, I usually buy an organic sort, but he came back from B&Q with 4 bags of their own brand 'Verve' Seed Sowing Compost £3.98 for 20L. After all that moaning I can say that it is really good stuff and aubergines and tomatoes were showing within about 4 days on the window sill. i like your garden photos Lizzie. the first looks so hot and dry and the second looks huge! Love those - they remind me of something you would see in a garden of gnomes. Great ideas of what to do with a broken pot. Anyone could have a bash at those. ...makes me want to go out and smash a pot LOL. Am going to givie it a whirl, TOM. May use one of my Bonsai's as a feature in one . Lizzie that's lovely..is it your garden.? I really love these pots that Mac and Lizzie have posted, they have given me all sorts of ideas. I have two old metal chests that used to belong to my Grandad, they are all rusted up and not fit for anything so I may have a bash with those. Veggie,it's got my brain whizzing round as well. Well I'm cream crackered, I have moved 6 railway sleepers and 10 huge bags of compost for my raised beds. What have you lot got going on in your garden? So do you think they are all late then TOM? I am sure everything is a month behind. Birds are on schedule though. 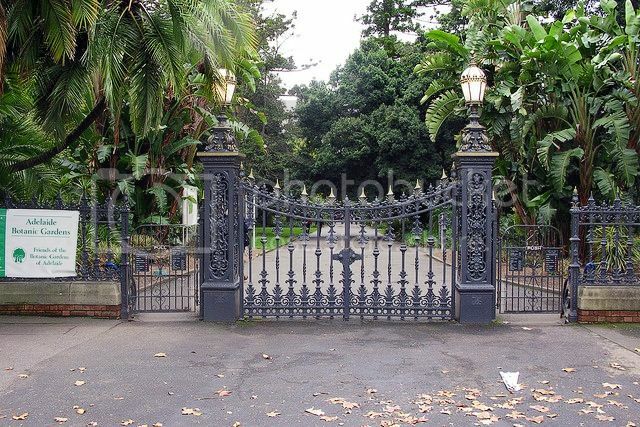 Aw Lizzie - that reminds me of how parks used to look in this country. Well, the last of my spuds are in, and I have just potted up my tomatoes and aubergines. I am growing a small variety called Arava. Never had success with Melons before. The cherry tree that I planted last year has blossom on it..so one never knows does one put runner beans in yesterday..planted garden peas..never done peas before,so we'll see..thought me grape vine in the greenhouse had died but it's on the go now,saw a lovely healthy looking dwarf golden delicious tree in Lidl yesterday £10..god I wish I'd more room..chillies not doing so good yet but probably like me waiting for some good hot sun..send some over Lizzie please. Momac - I bet those peas don't see a pan, the taste of them straight from the pod is something else. I'm sowing some sweetcorn, radishes, spring onions and salads today. Could anyone tell me the best place to get some topsoil and how much i should expect to pay? I've been offered some at £15 per ton. Nutty Tart - open a new thread on General - FTAO Nana Jacqui. TOM - all is forgiven. Cool photo of the butterfly. Size is irrelevent ya know. Any ideas for repairing lawn in shaded area? TOM I have used the miracle grow seed thingy, where you sprinkle it and then wait for something to happen . Obviously you can tell I am a strong gardener. . When putting new seed down do you cover it up with some soil to protect the seeds or do you leave on top. I know that which ever way it is you then water it. TOM I took a picture of one very similar on Tuesday near the pond behind Almond Brook Hotel. Gareth - be sure to keep the kids and the dog off when you have sown the seed. Bloody hell it hot out there folks! Just transplanted some onions, sown some flower seeds, next is peas and beans. The blossom on the cherry trees is beautiful, even my son commented on it this morning - and he don't usually show an interest. I hate weeding it gives me headache. Forgot, I have just planted a Gooseberry that I have raised from a cutting. Late?? I have heard of people only starting in June. I'm aching after yesterday, but will soldier on. I don't like working in sunshine, but rain is forecast for the rest of the week. Not heard from Nightchap in a while, what you up to Nightchap? 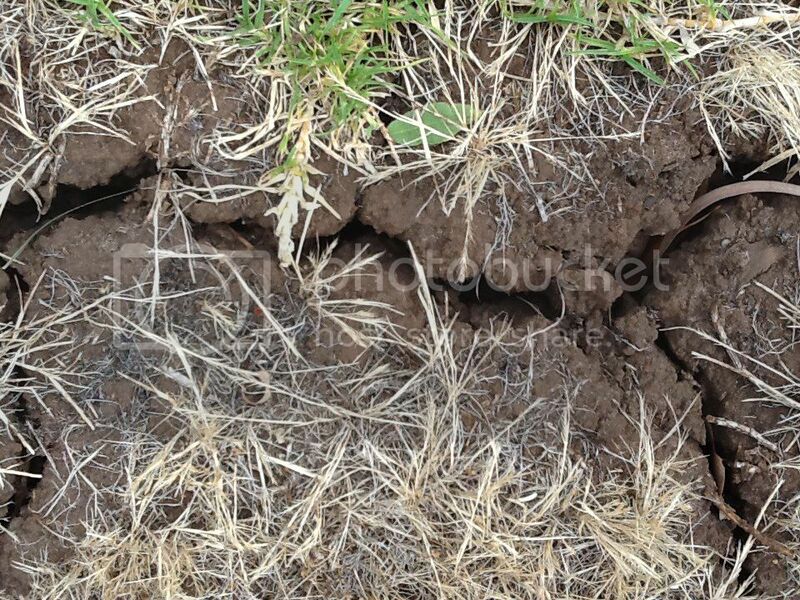 I remember finding ants in my patch at the side of the house, and it being heavy clay, they didn't half improve the tilth. If the nest is in the ground, open it up - the birds will eat them. My dad used to throw bits of bread down near the ants,the birds came down saw the ants and had them too. Oooh Lizzie,that could have nasty. Momac - don't you mean TOM? It was TOM with the jerry can. Heart hasn't been in it today, still aching from yesterday. I was out at five and I have done 'some' but not nearly 'enough'. Not even done any work either - a day off. I don't like it when it is too warm, and neither does Thor - he's been crashed out the last two days. "I'm A Fire Starter, Twisted Fire Starter". Momac - yes Thor is getting very big. I have photos of him on my computer and I will post one or two soon. He is a right poser for the camera. Weather gone backwards, I've been cold the last couple of days - I was only saying the other day that it was too hot LOL. For anyone interested - 38 Degrees are giving away some bee-friendly seeds, I got some from these last year and they were very good. Veg grower - Still here, looking in every now and again. Just potted out some tomato plants this week. My mrs likes the crunchy tomatoes that can be bought in most supermarkets imported from the Canaries. A friend of ours brought back from the Canaries some tomato seeds called Canario, so I am looking forward to see what results I get. My experiment with bud cuttings from my grapevine seem to have worked so I will have a few to give away at the end of the year. 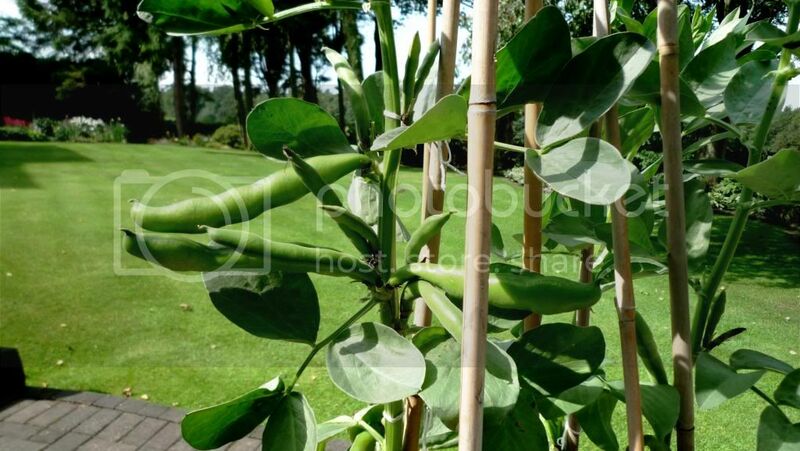 I've planted all my veg seeds for this season - peas (now just showing ), runner beans, broad beans, onions ( doing well ). There seems to be a lot of blossom on all my fruit trees/bushes this year. Strawberries in the greenhouse are full of flowers. Lets all hope for a better summer than last year. They are not in the same greenhouse - I have 3 greenhouses. One I use for tomatoes, the second I have a grapevine under planted with strawberries. The third is more or less used as a potting shed even though it is a proper greenhouse. What did I do wrong on the links. I have put photo's on before and never had a problem. Just spotted - capitals instead of lower case. Thank you for your help. Nightchap - good to hear from you and more great pics I see. 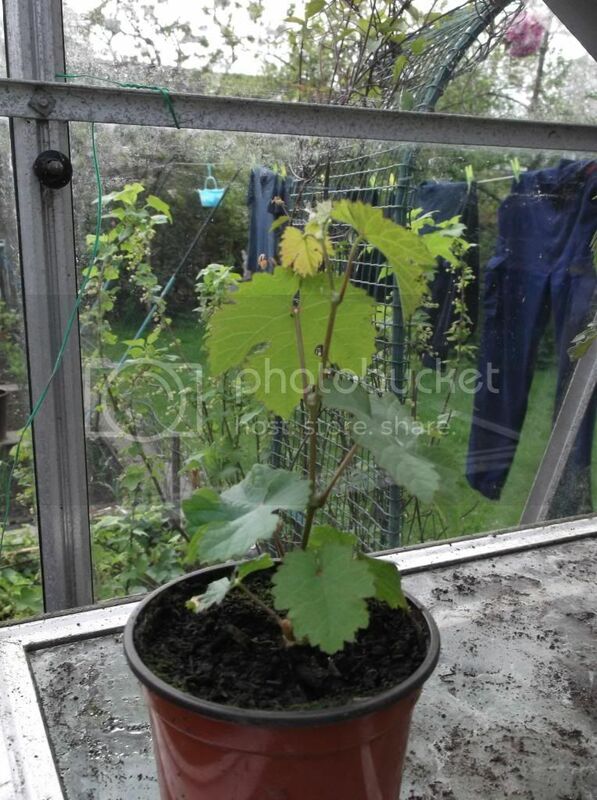 That grapevine cutting has taken really well - looks really strong. Do you net your red-currants? I have never netted mine, but I have more blossom than ever this year, and the birds will take the flowers as well as berries. Not sown all my veg yet - I am hoping to finish that in the next few days. Will be much easier with the raised beds, free draining as opposed to boggy clay soil - last year was a wash-out. I agree, we must all hope for a better summer - I am seriously considering worshipping the sun LOL. VG, yes I do need to net the redcurrants. I put vertical canes round (with a plastic pop bottle on top ) to form a circle and wrap netting round, then throw another piece of netting over the top. The pop bottles stop the netting getting fouled by the canes, all held in place by spring loaded clothes pegs. Last year I got a good crop despite the poor summer. Has anyone ever ordered bedding plants for delivery? I usually pick mine up from the garden centre, but had a few emails from T&M, The Mail etc and they all look lovely. Any of you lot ordered bedding plants before, where from and were they any good? Yeah, I get occasional money off vouchers from T&M, but then as you say you start looking for things to buy. It is for baskets and tubs at the front, I say every year I will raise my own, but with no proper greenhouse I haven't really got the space - and the dog just ends up knocking things off the window sills. I may buy from T&M then - thanks for taking pity on my post, I didn't think I would get any replies there for a minute. Just been to hang some washing out and next doors cat is in the garlic box - this is after finding Thor trotting through the bloody onion patch this morning. I have some netting, but I hadn't got round to putting it up, because my son has burnt most of my canes when we had the bonfire - he said 'I thought you would be buying new ones for this year'. I am having one of those days LOL. Your back door was open . Is it Thor? Dirty minds the pair of yous. TOM - yeah, my son is giving me a lift tomorrow with the stuff I have. Got my Evening Primrose seeds through the post today, never grown this before so should be interesting - will flower August til Sept. 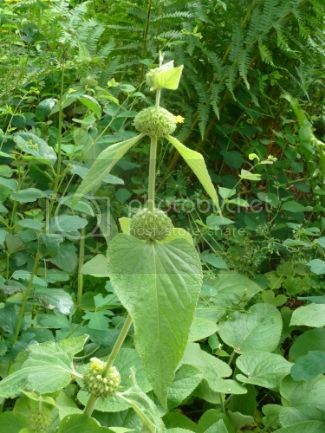 Apparently, the yellow flowers open in the evening, and the young shoots can be eaten as a vegetable with a peppery flavour. I think I need glasses - I was squinting at the writing on the back of the packet. Got mine too Veggie..chuffed I am..sowing them tomorrow..you can also get free ones in the packets of Bite-Sized Shredded Wheat are well if you like Shredded Wheat that is. I have never bought it TOM, but off the top of my head I googled Wickes. Bloody hell £25. I didn't look that far. Are there no builders yards near you? I think a lot of the smaller firms deliver for free. Have you tried Nana Jacqui? It'll look lush in no time Lizzie..what I'd give for so much room in my garden...and those trees at the back..I think they're gorgeous. Lizzie - the pics of your garden are becoming steadily greener and brighter, I also wish I had as big a garden as you have. I notice Jamie Oliver has his own compost/growbags out, and seeds etc. I think this has knocked some of the prices up. I have just bought some growbags from Wilkinsons £1.75 each or 2 for £3 - thought I would see what they are like. I am beyond skint and beggars can't be choosers LOL. Heres a little tip I heard on a gardening phone in ref cats pooing in the borders. Thats a great tip BRW - and welcome to WW. I know holly leaves are lethal long after they were green, my hands are testament that they never lose their sharpness. So, do you grow your own stuff then BRW? TOM - I didn't realise growbags were that cheap at B&Q - I tend to look online before I shop and hadn't noticed any offers. Last time I looked TOM they weren't offering that. I have some vouchers for B&Q, I may go this week. Would like your view on the best winter veg to grow?? BRW - this year (for winter harvesting) I am growing leeks, parsnips, broccoli, sprouts, beetroot and spring cabbage. I am also thinking of trying some savoy cabbage, which I have never grown before and any other odds and sods I can squeeze in anywhere. Ooh, and I am thinking of starting some Garlic off in the autumn to give me a head start for next year - I usually plant in spring, but the bulbs are never that big. Another new one for me this year is red cabbage (pigeons ate last years seedlings lol) I love it raw, cooked and pickled. I am not an expert - I just love growing my own stuff. Please keep us updated with how you are getting on - we are all praying for better weather this year. Ann they're doing okay..at least some are..some were got at with the snails..there's hundreds(or so it seems)in our garden..I'll let you know when they're in flower. Hope they weren't watching through the window. Oh well,in that case I'll bring all mine and he can have them as well. Ahem - you do realise that slugs and snails have a homing instinct??? I found one in the garlic box the other night - I think he was just passing through because he was going straight down the middle of the row - I don't think they like garlic. I used to throw them over next door, but I don't bother anymore. I love everything - and I want as natural a garden as I can get in the back, and they feed the resident birds. I have started to let the grass grow a little, and I don't pull up every weed - I figure they are good for the bees and butterflies. I've halved my carbon footprint this year by building a huge raised bed on my back lawn - I'll save a fortune in petrol. Daffs now gone, bit of a mixture here now. Ooh thats nice and lush - is that running down the length of a path or driveaway? Will get the last few things potted up today, weeding in the back and sowing some more flower seeds. I might even put up that portable greenhouse I have had (still in the box) for about the last three years. Just caught Thor chewing the trunk of my Victoria plum - its only a very young one, I can't see any flower buds on it this year either. I may dig it up and stick it elsewhere because it is along the path he treads. Make the most of it chaps, because it is forecast to rain on Monday LOL. Wow, big difference between the first and second pic, and look how much greener your garden is now. Let us know how you get on with your veggies Lizzie - is that your veggie patch on the left hand side? On about the slug deterrents - I haven't the heart to get tehm drunk, and as you say Thor would probably drink it. I am happy to let them be for now. 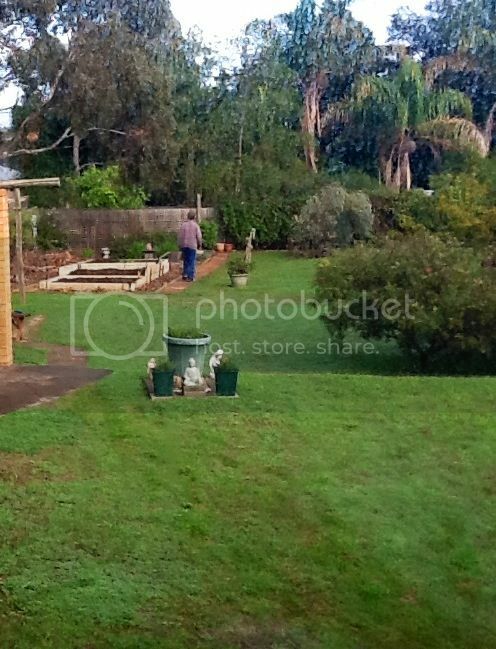 Yes veg it is, that is my hubby and he has just weeded the veggie patch, he has a habit of commenting that the weeds are growing again, usually I take pity on him and do it.....but he got around to doing it this time. My word Maxine,you have been busy..you must be very green fingered..and doesn't it all taste good when you've grown it yourself..and yes roll on Mr sunshine. PeterP - Is your orange tree a Calamondin? There is lots of info about, I just wondered if you knew the variety. Lizzie - I would love to keep chickens but I'm not allowed where I am - its a shame you had to get rid of them. Maxine - I envy you with the allotment, I gave mine up when I split with my partner. Hope we get plenty sunshine this year. Ooooh, might get one - I have a LIDL at the bottom of the road, and I have just cleared my overdraft LOL. When looking up ornamental orange trees it says that the fruits can be used in cooking - obviously I would have to check it out fully, but even on their own they are quite decorative. Bloody hell - you knew I meant LIDL. Peter - I have never grown citrus trees before, however they are a lot more affordable these days, and I hope to buy at least one this year. I have found a link to the RHS - who I find give standard but reliable advice, the thing I would be concerned about is the night-time temperature in an unheated greenhouse in winter. Anyhow, checkout the link and see what you think - the website also has other info about any possible pests etc. They sound very easy to manage, and from what I can gather off the net, although it is ornamental the fruits can be used in cooking - however this would need further investigation. Please let us know how you get on with it. Edit: on scrolling down a little it mentions the minimum night-time temperature needed for the Calamondin. TOM - I agree - I wouldn't mind one inside my house - I meant if he intended keeping in the greenhouse through the winter. £4 sounds like a good price to me - I would still pick them up. On Monty's link above he said the one he was sorting had cost £35. Some folk have more money than sense - mind you, the licence fee paid for that. Give it some TLC - it will be fine, and soon be as big as Monty's. don't know if its any good but Which are offering a free grow your own veg guide. To get it call 0800533090 and quote code VEG504F. Oh Lizzie.. when the sun comes back out,you're gonna have a real lush garden. I-spy - thanks for posting that. I ordered this last year from Which? I also received two free packets of tomato seeds too, besides the handy guide - well worth the time it took to make the call. Lizzie - do you mind if we keep the sunshine for a little longer? Our spring is at least a month behind. When we are parched, we will send it back to you and you can forward the rain to us. I've never done any foliar feeding, I've always been frightened of getting it wrong. Has anyone propagated Wild Garlic, and did you do it with the roots or seeds? I have some out the back but would like more. My brother has just got an allotment and I am very envious. Not much Pear blossom seems to have taken this year -Cherries, Apples, Gooseberries, Redcurrants and Strawberries I would say are showing better than last year, though I think I will be very lucky to see any Apricots. My Climbing Roses are looking good - I think this may be down to the late pruning, no noticeable infestations of greenfly. Unbelievably warm this evening with just a very light breeze - been a long time LOL. Birds are going hell for leather on the seeds - I can stand at the kitchen window and literally watch them drop on the feeders - lots of baby birds fighting for the food. My roses (all varieties) seem to be taking their time at opening, same with the clematis - anyone else notice this? I have a clematis Montana that's flowering,but it is the most common one and hardy,but roses are definitely taking their time..hopefully more sunshine will help them along,mind you,I've never stop spraying the greenfly on them,they're just covered in them..nothing seems to stop wild garlic though,it's rampant. The ones from Wilkos are really good. ....although I have only potted up with them so far - have yet to see what kind of crops I get. Great weather this, lovely being out with the dog all day - we were up and out at 4 this morning. Same time as me Veg....I am up at 4 but I am still in bed due to the fact that.....well ya know it is winter here......brrrrrrrr!!! Lizzie - it was only a few weeks ago that I was shivering. I was using the fire up until the end of May. Got another Mother Blackbird shrieking away outside so I have sent Thor out just in case there any cats. Sounds like the chick is in a tree as opposed to on the ground, so hopefully there will be a better outcome with this one. Had lots of this over the last few weeks, what with this and Springwatch - it is all too much for me. Lizzie that Cape Honeysuckle is beautiful - really vibrant. Thats a cracker Lizzie - yes, leave the nectar for the birds and bees and then chop it after flowering. 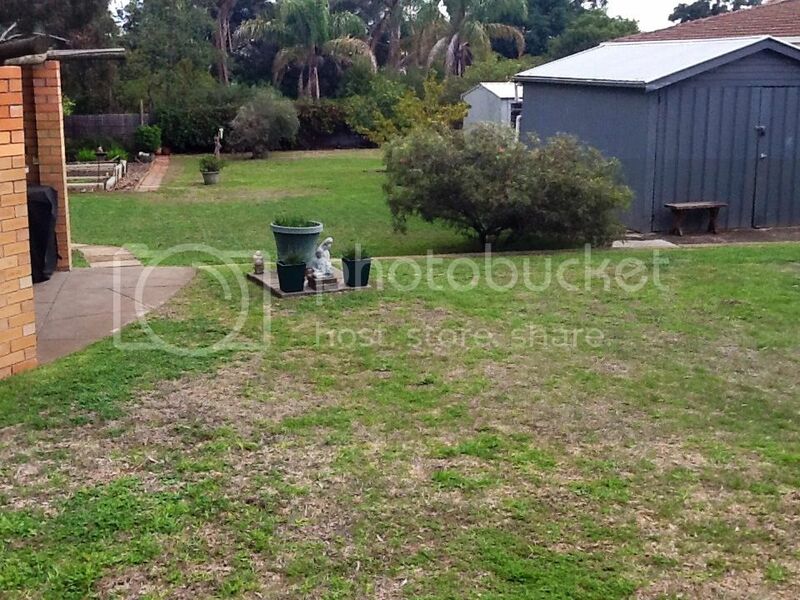 I bet your husband has his work cut out mowing your front lawn. 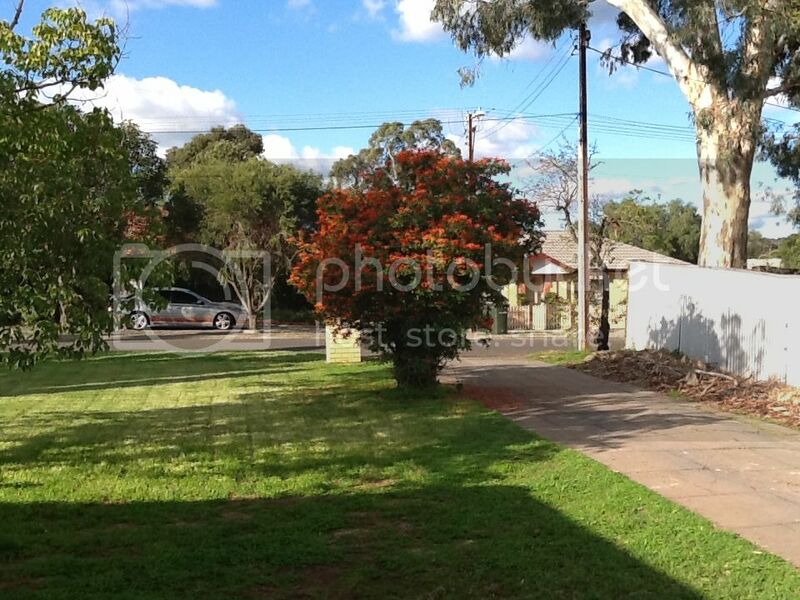 PS - thats a lovely old tree in your neighbour's garden on the right. Bhutan plans to become the first country in the world to turn its agriculture completely organic, banning the sales of pesticides and herbicides and relying on its own animals and farm waste for fertilizers. I doubt they will have to change much - I think they are one of those countries that shuts themselves off to the rest of the world. I am sure I read somewhere that they are the least developed country on earth. We have similar laws regarding trees in this country Lizzie, he would be better to cut back rather than kill it. Trees give us the oxygen we need to survive. wrong photo. this is a cedar! Sorry I can't help with the flower - but the bark on that tree is beautiful. Does anyone know if ash is good for mixing with soil? Gareth - yes - so long as the plants aren't acid lovers. If you have strawberries - they love a dressing of ashes. Ashes from recently pruned trees/hedges and what have you gives the best results. Those grow -bags I got from Wilkinsons are well good. Had good results with the tomatoes and aubergines, just waiting for the fruit. Hark at Monty Don running in out of the rain (last night) the soft bugger, I could understand if it was the middle of winter. I am sure Carol Klein has had surgery - it used to look like her face was sliding off, and now it is all plump and taut. I definitely noticed different about her..thought at first it was her teeth that had been changed at first..have to laugh the way she pronounces flowers...flarrs. Momac - she always sounds like she is drunk to me. A quick Google reveals she is from down the road in Walkden. Also..a couple who were admirers of hers bought a house with garden adjoining hers,but trouble started when Carol put her compost heap right on the very edge of her garden that was too close to theirs..so they're not speaking now...aren't we catty. Anybody tried one of these "ASADAS" (Digging Hoes) yet? 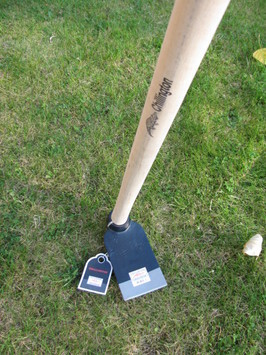 Easier than a spade, different sizes for different conditions. I've just received one & it's a doddle to use. Weeding gives me a headache - the only way I can weed without getting a headache is to kneel down. Art - that looks like a handy instrument, thanks for posting a pic of it! So, Thor has been eating the strawberries ripe or otherwise, I should have netted things off. Still redcurrants and gooseberries are ripening nicely, and although the apple blossom was late this year - they seem to be really making up for it - they are swelling beautifully. 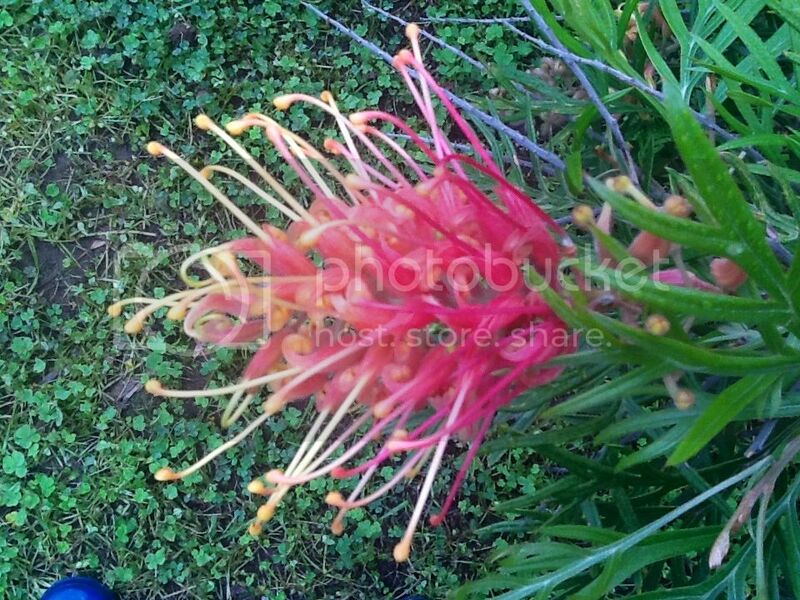 the grevillea superb is blossoming lovely....oops....blue boot....tsk tsk!!! Lizzie - that looks quite tropical. .....and I don't mean the boot. The hot weather is here hope it gets the flowers blooming folks . 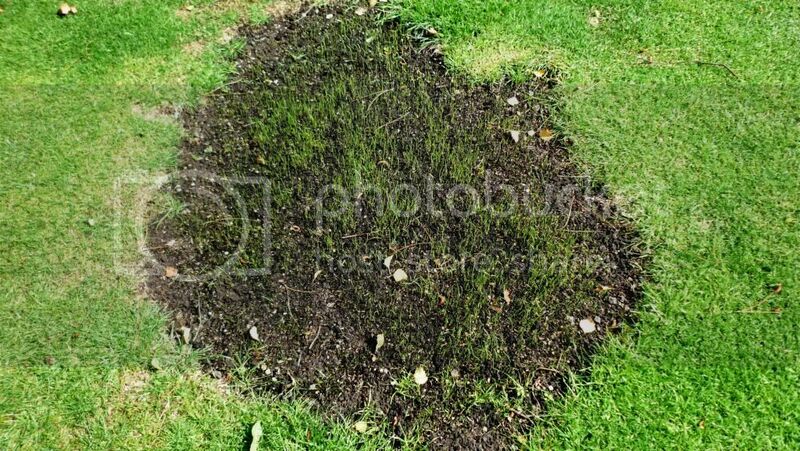 Anyone know how to remove broadleaf grass from lawns, leaving just the fine leaf stuff to flourish. Very nice TOM.....do you get some butterflies around it too.? In the paper today. An 85 year old woman used a bottle of red wine to kill off some slugs! Picked some lovely new potatoes yesterday, also redcurrants, yellow raspberries, red gooseberries - God these are nicer than grapes! I think Thor may have done for my onions - they not looking to big, garlic looks better, only me has them anyway. Got lots of cherries this year - had none last year, and there is a chance the birds may take these as they not ripe yet. My redcurrant bush looks full of rubies - I will have to freeze some, got some younger ones coming on nicely. This old one, the branches are spreading like I don't know what, some nearly touching the floor, will have to support this, first job today. What are you lot up to. Picked some potatoes out of bags today,had some with a ham salad..boy are they good..and here's me trying to lose weight..had some strawberries each day this week..not touched the peas yet but they look very nice..can't say I'm going to have a lot of toms though..cucs are coming on..cherry tree not produced any at all..this is it's second year..hopefully next year I'll have some cherries. Picked about 8lb so far. Birds have more or less had all the cherries ( can't net a 15ft tree ). Onions, peas & runner beans doing well, Had quite a few strawberries/raspberries. Damsons looking good, I didn't have a single one last year. Plums look good. I hope adding calcium to the soil stops my apples from getting bitter pit this year ( fingers crossed ). Overall a lot better than last year. Nightchap - do you ever freeze your redcurrants, and if so do you leave the strings on? I have always removed them but it is quite painstaking. How did you go on with those Spanish Toms? My Gardeners Delight are a bit slow to flower/fruit this year. VG - My dad uses them to make red currant jelly and to take the currants from the stalk he holds one end of the stalk and uses an ordinary table fork and slides it down the stalk. I have never tried to freeze them. The "Canario" toms are doing well, plenty of flowers and quite a few have set. T of M - As I understand it, Bitter Pit is a condition rather than a disease. Of all that I have read about it there are many possible causes, but the main cause that all seem to agree on is a shortage of calcium. Having said that I have read that even on calcium laden ground apple trees can still suffer from it. It is then caused by other factors such as not enough water, not enough iron in the soil, bad pruning, damaged bark - the list seems endless. Last year I tried spraying the tree with calcium only to find out that on my variety it makes the leaves go brown at the edges. I didn't read the small print until too late oops. The apples are still edible - just have to peel them first. I'll let you know if this calcium treatment has any effect - so far no bitter pit - but it is early days. I have only ever heard of Bitter Pit in old gardening books. I have five apple trees and the only thing I have ever fed them with is the odd bit of liquid manure. Seem to be doing better this year with the apples, struggling to see the pears - think the blossom was had by frost. Funny thing about this years weather with Winter in the Spring and Summer arriving very late the end result in my case is that my garden is looking noticeably better than usual in July.Anyone find the same. I will go along with that, everything is lush in the back, fruit is doing btter than ever - apart from pears whose blossom was lost to the frost. Seem to have more fledglings too this year, I have never seen so many baby birds, or bought so much seed/nuts etc. My neighbour is cutting down his Elderberry tree, so I am going to take some cuttings, would rather he kept the tree. Made some Redcurrantjam with my home-grown Redcurrants yesterday - very easy to make too. I am making Redcurrant Jelly with the other half today, in between eating them of course. ....may try raspberry next. Not doing as well with the strawberries this year. Found this site earlier, whilst checking on how to freeze fruit and veg. It covers each one individually, handy if you are not sure about something. Jo anne - thanks for posting that link, I've signed up for the newsletter, there is something for everyone there,I imagine it will be a good week - lots happening in Manchester at the moment. Watching the news recently, and there have been many features on railways stations and other projects, were people have been sowing and planting veggies, and allowing people to help themselves. Has anyone seen any of these? I haven't seen any projects where people are allowed to help themselves to produce yet, Veg Grower. They sound like great community-minded schemes. 'Do you love gardening? Would you like to pass that skill on to others? Do you wish you had an allotment? The Brick has a plot on the community allotment on Worsley Hall. We need someone to accompany clients and pass on their skills, whilst having the time and enthusiasm to help with the plot. trawled through gardening posts this morning and see there is some discussion on compost. I use B&Q verve general for everything I mix it with SHARP sand not BUILDERS sand, this makes it go farther and provides good drainage. 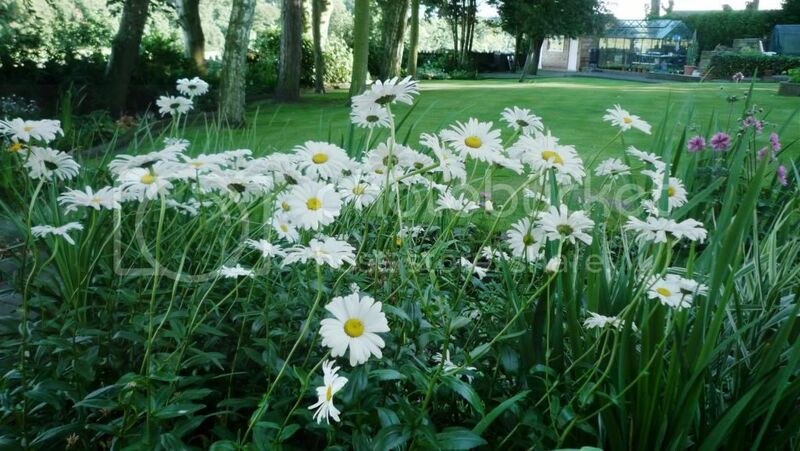 I also have these marguerites which must be at least 50 years old as they were here when I moved in over 43 years ago. I do thin them out, anybody wants any they are quite welcome later in the year. 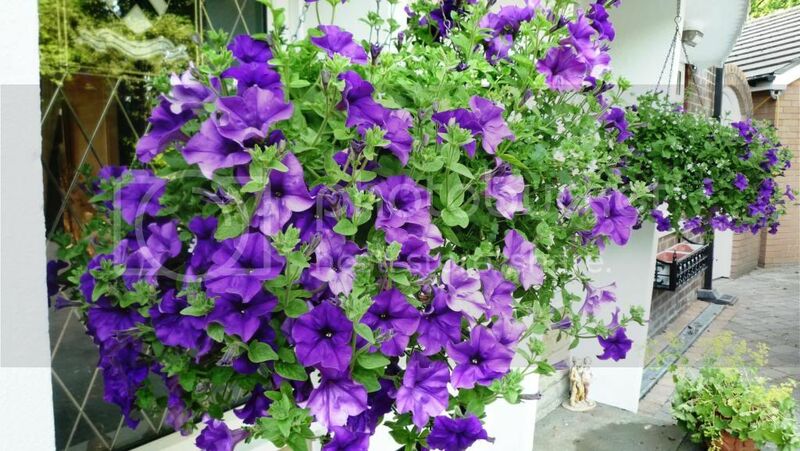 Lizzie, Surfinias, trailing petunias. Grow very well in the mix I described as does everything else. 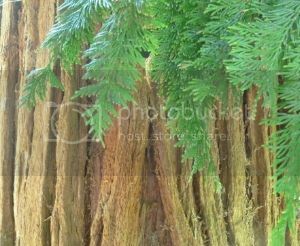 Anne - what trees do you have in your garden - although I can't see them fully, I think they look magnificent. Momac how are those seed doing are they flowering yet .Some lovely hanging baskets and flowers keen gardeners on here and some good tips . Veggie, quite a selection of trees, several conifers , sycamore, scots pine, Norwegian spruce? copper beech, silver birch, crabapple. All except the crabapple tower above the house but pale into insignificance compared with one of my neighbours trees. A giant beech which when I first moved here some initials with a date carved. The date was almost gone but was either 1908-09-05 now grown out altogether. So this particular tree must be knocking on for at least 150years. Your Thor would have plenty to wee wee on. Ann..lots of flowers in bloom and lots been eaten by those little so and so's..snails..tomatoes coming on now after a slow start..runner beans have been successful..cucs still growing,but next year am going to get couple of fruit trees..hope you're well chuck. I opened the back door last night to let Thor have a pee and because I had the kitchen light on - I could see loads of moths flying towards the house - it was quite eerie, I might film it tonight. My apples are growing beautifully, picked the last of the redcurrants, birds have eaten the cherries, I am on my third picking of my red gooseberries and they are so sweet, still picking red and yellow raspberries, my strawbs haven't done as well this year. Outdoor tomatoes really come on since I planted them out - funnily enough I was debating whether to burn them they had gone a bit leggy on the windowsill and looked the worse for wear - now they are thriving, and I am glad because they were from organic seed and a bit expensive. Done alright with the garlic, but the onions are not what they should have been - but I will blame Thor for trampling their bed. Got tons of Blackberrys - just waiting for them to ripen. Just heard on the news that the crop harvest is better this year - the farmers had such a bad year last year - I am so glad they are having a good 2013. Anyone watch Allotment Wars on BBC last night? Thats great Lizzie - I'm glad your farmers have done well too. Never,never,ever plant bamboo.I have spent 5 solid days clearing 1 sq.metre,broken one fork and worn out a hand saw.The darned stuff fights you all the way. I was thinking of planting some bamboo in a large pot to give my fountain patio a bit of an oriental look. Following your experience would a pot hold it in check. 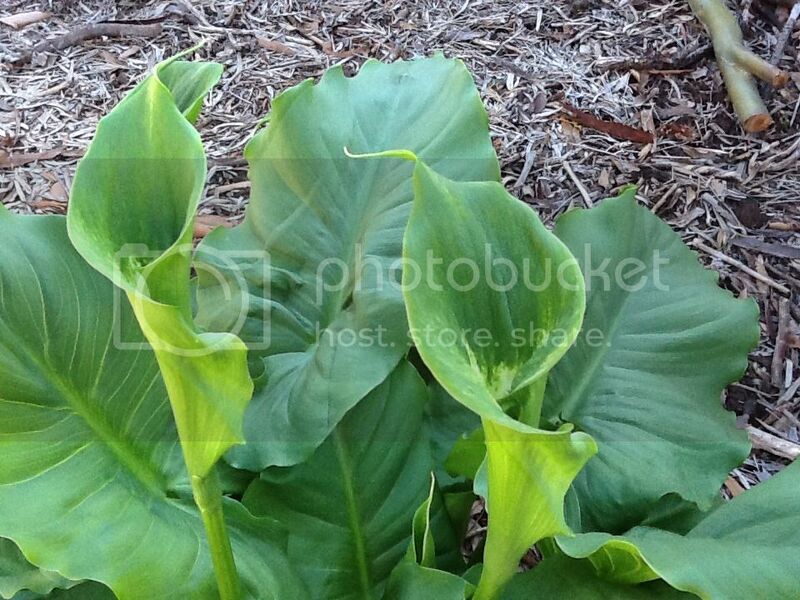 Hi Ane,I have seen the black bamboo thriving and trouble free in pots...looks very striking. I was thinking that maybe one of those fracking machines we hear so much about,would lift up bamboo. Dave - I have heard about bamboo being a devil to get rid of, a lot of people use it as screening, only fit for a permanent position. Aw Lizzie - you are all washed out at the moment, is there more rain to come or are you set for a dry spell? hi,veg grower.The bamboo I have can grow 12 ft in a few months.The shoots are very close together ,almost touching,yet the root of each shoot is the size of a football,so each one is interlocked with its neighbour.I removed it one shoot at a time and had to hose blast each shoot as I loosened it.Cutting the roots with a sharp spade is very difficult as the spade often bounces of the bamboo and you could loose a toe or two.I have won the war but not the battle. On the other hand I have a beautiful broad leaf grass.The leaves have a white stripe and it grows up to 15 ft. each year after being cut to the ground in early Spring.It is non-invasive and in spite of its height does not require staking even in very strong winds. I wish I had the space for some grasses, I've seen some lovely displays in larger gardens where they aren't restricted, there are lots of smaller ones I know. Right folks, I'm off to pick my Blackberries and make my mother some more jam. Apples are looking good too, nowhere near ready yet though. You don't need a lot of space,Veg grower,just a few sq. metres.Nothing looks better on a windy day. I think it's phyliostrachis aurea,the one they feed to pandas,townofmemories. "Phyllostachys nigra" - is non invasive and does well in large pots. Lots of other info online, very striking/decorative. Thanks Veggie will look it up, such a lot on at the moment. I have just cleared a few shrubs that have been there for 20 years or more.I am going to plant grasses in the empty space.Not a great deal of room so I will plant about half a dozen varieties.I am thinking of planting in large pots buried in the soil so that the strongest wont take over and they wont all run into each other.There are so many different sizes and shapes and colour that the effect could be quite striking. Grasses are used a lot in 'sensory gardens'. Was looking at them in the garden centre yesterday..they looked lovely blowing in the wind..I've never took an interest in them before..my tastes must be changing,I've got a nice couple of spots in the back garden. I've had a miniature Rhododenrun for a couple of years. There are buds all over it but it never flowers. What can I do. Is it in a pot or in the ground? If it is in a pot I would imagine that is the problem, but I am no expert, perhaps someone else grows them and can advise you. veg It's in a pot. tom It's just ordinary compost. The amount of buds is unbelievable. I am wishing they would come out. I think rhododendrons are beautiful, I always remember them from my childhood, they were in all the parks. How big is it Marie? veg It's in a pot and about two feet tall. When I look at it with all these buds on which don't flower. I will try ericaseus feed as tom suggests and see if that helps. Personally I think it would do better in the ground - sometimes they are given no special treatment when in the ground, and they do thrive - but growers now tend to do as TOM suggests. So, my Thor is helping himself to apples from the trees, I think he did the same with the raspberries and strawberries this year - hardly had any. Funnily enough, he never touched the onions or garlic. Tom is right,but I agree with v.g.I think it would do better in the ground..I think all plants will do better in the ground...nearly all mine are in tubs..everywhere was flagged in our garden because it was always waterlogged...Veggie, Owd Dave that used to be on w.w has two pugs and are always pinching his tomatoes. I caught him with one on the couch this morning, and I actually praised him, rather he brings an apple in off the tree than a bird. I'm afraid he became fond of one or two fledglings this year - he didn't bite or eat them, he just picked them up by their tail feathers and then put them back down again, he only wanted to play - poor birds. He sounds like a great dog..pity they're not all like him. He has a wonderful nature Momac - exactly the same as Molly was actually - its funny I didn't expect that from a male dog. Never had a growl out of either of them, not even when playing. I beg your pardon, I called you Lizzie. It's all about the owner veggie...I can't see where you called me Lizzie. Its okay I amended it @ 16.12. Just picked, and am now eating my first apple of the year, the shops cannot match this taste - Thor is waiting for the core. I have caught him stealing one or two from the lower branches recently but I don't mind. TOM - do you not worry about them getting diseased by leaving them on the tree? I have some that are marked on the skin but I will just peel these and use them for cooking. I have another tree which I know has brown spot but it is round the side, will leave those for the birds over winter. ideal for baking or chipping.My question is ,on the plant tops there are some green tomatoe like round balls about 1 inch dia ,can these be used to grow more potatoes ?? Dave - as far as I am aware, the 'fruits' from potato plants never run true to type, ie: you may end up with something different to this years potato crop. The potato growers/experts make use of them with regard to breeding better strains of potato - better against certain diseases such as blight. They are toxic by the way. they had pink flowers ,this years had white flowers which were sprited potatoes i had left from the spar. There was a discussion about this not long ago, and on further research I found out that not all potatoes will produce fruits. I think the growers have managed to develop them so that the plant concentrates all its efforts into the production of the potatoes underground. Still picking apples 'ere last few I will leave for the birds for winter, lots of tidying up to do, need to have a fire. Replanted some of the garlic cloves and some carrots need picking. Awww thanks Lizzie, he is diving on and off my bed at the mo, I have had to give him his own pillow - he can strip a bed and pillow cases in no time at all. Dougie, l have a Christmas cactus that didn't get many flowers on soooo like you l put it out in the garden, then when it started to get cold l felt guilty and brought it inside. to my surprise within a couple of weeks it was full of buds then flowered like yours, love the bright pink colour. l forgot to bring the tomato food indoors, it will have to stay in the shed now, had a snow storm yesterday and overnight. about 2 ft of snow drifts in front of the shed. temp is minus 26c with wind factor. On Thursday 13th February you can learn how to winter prune your fruit trees and have a nosey in the Walled Gardens at Haigh Hall. On Thursday 27th February, you can come and take part in a fruit tree grafting session. Both at Haigh Hall, 10am - noon. I know this is a bit late Dougie..but I have a Christmas cacti that flowers every Winter,but I keep mine upstairs all year away from daylight until it comes into bud then I bring it down to enjoy the gorgeous flowers..I was always under the belief and also read that they hadn't to see any form of daylight during the dormant period in order to flower..but you have really knocked that theory in the head haven't you..not to believe everything you read.. 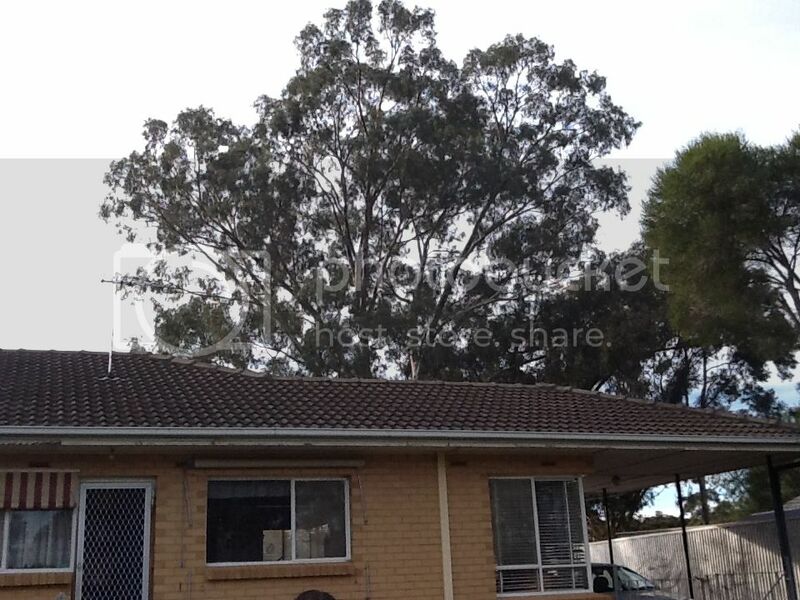 So - I have down-sized and I am back living with my mother as I could not afford the rent by myself after my son moved out, no garden just a yard - where to start LOL? I feel for you veggie…keep doing the lottery,in the meantime,the pound shops sell plastic pots and cheap seeds..in the meantime,good luck to you,you never know what's around the corner. No luck on the lottery Momac. A lovely week is forecast so no excuses anyone, not even for me and my yard. veg grower, sorry that you lost your garden, l enjoyed reading about what you had planted and harvest. l am sure you will have another garden soon, in fact you will have lot/s of fun planning your new garden. Last yr l did mostly container gardening and enjoyed the challenge. l grew dwarf apples, potato and carrots, onions herbs etc. good luck. Don't lose heart veggie, a number of my relatives had yards and made them both productive and beautiful, especially grandad. Thank you for the encouragement ladies, I have a few things planned - but the first job is to replace my brothers small sapling of an apple tree which my dog Thor chewed the first week we moved in. I only have a yard but ive got some climbing roses and blue morning glory from seeds i like me flowers and me flowers make me happy . I love climbing roses, those and morning glory are great growing against fences or brick walls. I am going to sort my Mum's shed this weekend, then I can start some sowing. Veggie..while your'e waiting for your roses to grow,if you like Clematis..Montana will grow very fast against a brick wall. Thanks Momac, I had a Clematis at my old house and a bit gutted about leaving it - I left it because they don't usually like disturbance, not sure what type it was, but I will look up the Montana you suggest. Momac never heard of the montana where will i get one of those please . Ann,B&Q have them..in the meantime Ann,I'll see if I can get a cutting from mine to take for you. Montana because of its speedy growth is also sometimes called the "Mile a Minute Clematis" hope it helps to anybody looking for one. Been down to my brother's allotment this morning and I am soooooo envious, he also gave me some of his seed potatoes - King Edward - which are a maincrop variety. Painting my Mum's shed in the yard - I fancy it for an refuge/office. What you lot up to? Just been looking at the sheds women have painted in the Daily Mail supplement..which ours could look like that..I keep fancying painting ours a nice pale lemon,bit Cliff says it won't work and will look dollish,but I don't know..I'm very tempted. Momac - I saw those sheds featured in the DM and they look a bit designer - nice if you have the money I guess. I'm doing the inside at the moment with some paint I had left over from my old house, and it is a very pale pink/beige (off-white I guess you could call it) and I was contemplating buying pale green or blue for the outside, but lemon sounds much sunnier. I agree Veggie re the cost of those sheds,but our shed is so full of stuff...where do those women put all the gardening tackle etc..I would dearly love a shed like those..aren't some folk lucky. Been painting the inside of mine shed, and I am about to sow some Morning Glory seeds that AnnSpam mentioned, whatever else I have enough pots for, oh and my King Edward potatoes. Sown some Sunflowers, Moneymaker Tomatoes, Aubergine, Beth Cucumbers - they are a mini variety and some Beetroot called Wodan which I have never grown before. I have a mini plastic greenhouse which will just fit down the side of the shed, so will not (should not) blow about. Be careful of water pooling on top if it is one of the ones with a plastic cover. Good point about the rainwater Harry James. This is the first time I will have used it - had it 3 years and it is still in the box. A cloudy day today but wall to wall sunshine forecast for Friday and Saturday, anyone got anything planned for the garden??? Veg grower how is your morning glory seed doing with this weather . I only sowed them a couple of weeks ago Ann, so they have only just come through, but they gave a sowing date of March/April same with my Sunflowers. I gave everything a bit of a feed yesterday in order to gee them up a bit and the seedlings are bobbing nicely in the sunshine. I take them in the shed at night just to keep them out of any frost although it did say to sow them outside. How are yours going on Ann? My dog Thor has been fishing the potatoes out of the sacks that I have planted them in - I'll be lucky to get any at this rate. Frost forecast for Friday and saturday night in the North West - I had better get my fleece out again and cover my tomatoes. I planted some wild garlic a couple of years ago we brought from Yorkshire,bad move..this time of year it's in flower and looks very nice but it literally takes over if you don't keep your eye on it..between paving stones among other plants..so if you see any growing wild..take a tip and leave it there. Learn how to grow your own veg on a special 12 week course in Wigan's Mesnes Park. •Join them at the cabin in the depot at Mesnes Park for a growing taster day on Saturday 31st May between 10am and 2pm. If you have a plant that is quite 'invasive', you can help stop the spread by cutting the bottoms off deep pots, and then plant them inside these pots, after you have sunk them into the ground. I've used Victoriana Nursery for seeds as well as plants, ann-spam, I rate them. Thanks harryjames ive sent for a brochure . Monday is all about food with cooking and clay oven making demos. Tuesday is all about bees and hens! Come and meet the bees and watch them busy at work in thier hive and watch how to make a traditional skep (10am-2pm). And Thursday is plant day with plant sales and tips and advice. All culminating in the Good Life Show Sunday 10th August. Has anyone got any lavender plants for sale please . Hi Ann..they're selling them cheap at Lidl. Anybody growing sunflowers,the flowers are just coming on now tallest one 7ft 5ins grow them every year sometimes I buy seeds ,and sometimes theres a few in my budgie seed mix i try them.To start them off I cut the bottoms off plastic bottles to cover them .it stops the slugs eating them till they get going. How neat and tidy; healthy too. Is that the clothes line your using? Will your budgies eat the seeds? No anne my clothes line is a retractable one,Ive fix the post to the fence with G cramps and put the ropes across to the clothes prop for extra support because strong winds are expected this weekend ,yes when the flower heads are dead I let them dry and break the seeds out and mix a few in with the budgie mix. I got some horse manure today for my roses does it bring them on or is it a old wives tale . Nasturtiums so next Spring I'll pot some up ready for you. Thsnks maureen ive got a yellow flower on my tomato plant will i still get tomatoes this year or is it to late with weather going cooler . Maureen This garden is driving me nuts. Everything growing like wildfire. I'll have another go tomorrow. so you'll not go short of plants next Spring..will get them all started then pot them up ready for you. Thats good to know momac thanks . Good for you Ann..chuffed as a butty aren't you. brought all my tomatoes in on tues - had frost the last 3 nights.the plants are all limp with the frost, the begonias are not looking too healthy .Having a nice tomato buttie for my tea-fresh bread, best butter , tom,salt and pepper! Marsin nice tomato butty with mayonaise . Sunflower update ,final height 8ft 9in, cut them down today and saved the heads, let them dry out and share the seeds between the wild birds and my budgies. 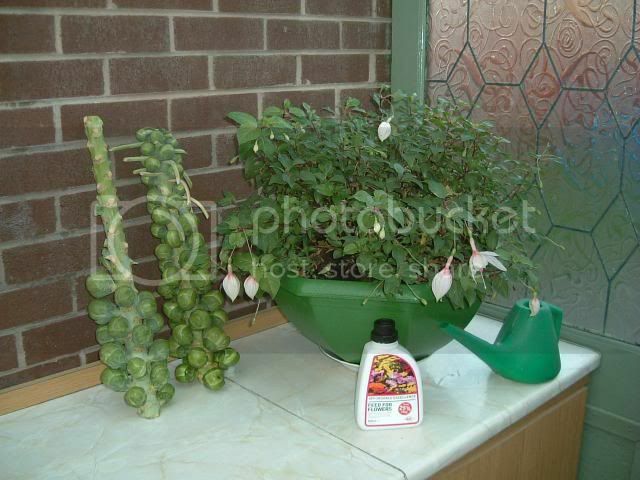 Dougie is the red plant a christmas one and can you take cuttings of them . I would like to propogate a blackberry ,from some I bought . I have tried about 6 times before without getting a seedling . The berries I have are very plump ,very sweet,and of course black but I dont know the variety, I would presume they are commercial and possibly foriegn. Any help appreciated. Yes,three varieties,but I have the climate for them,just south of Durban,South Africa.Try growing them from seed,plant out andhope.I grew them in Secunda up on the highveld where the winters were quite cold (minus five C),but they grew well. 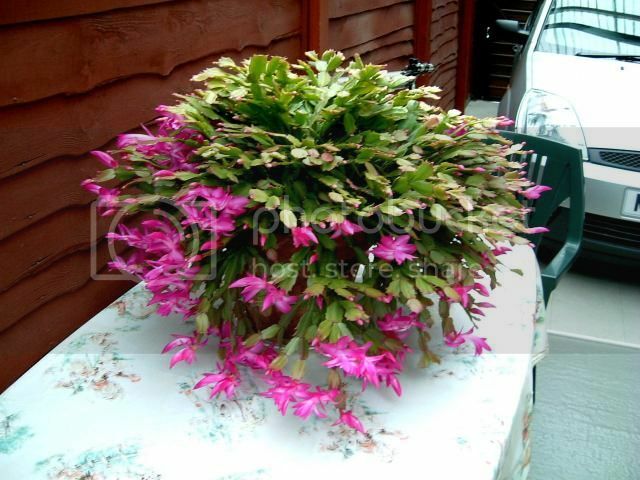 dougie, what a lovely Schlumbergera. 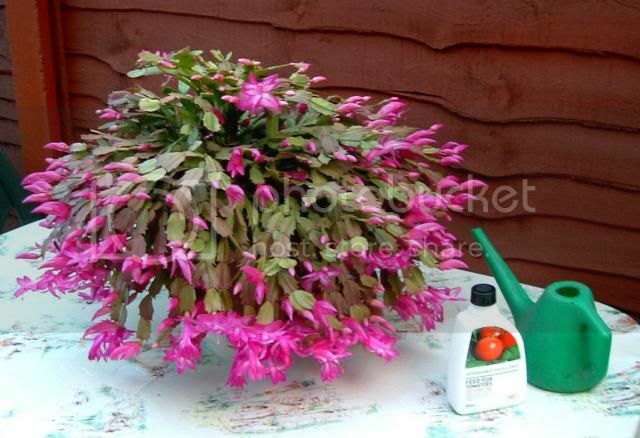 Sorry I just clicked on a link had a read and came across that lovely Schlumbergera Its a favourite plant of mine I have 4 one pink which flowers round Easter time and 3 red that flower round Christmas. I'm getting quite good at taking cuttings off these. Thanks..Ill have a go at that.